Mary Kubica is the New York Times bestselling author of THE GOOD GIRL and PRETTY BABY. She holds a Bachelor of Arts degree from Miami University in Oxford, Ohio, and lives outside of Chicago with her husband and two children. 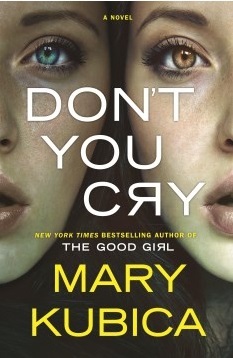 Her third novel, DON’T YOU CRY, releases May 17, 2016. Raising my children, being an attentive mother, trying hard to teach my kids to be compassionate and kind. I try my best to put 110% into everything I do. Many years ago I told myself that there were two things I wanted to do with my life: be a published author and run my own animal shelter. I’ve achieved one of these. The plight of homeless animals is something I’m truly passionate about, and hope to have more time and resources to devote to it in the future. My children. They make me proud every single day. There are many, but the one that weighs the most heavily on me is losing a loved one to renal failure a number of years ago. I’ve never felt quite so helpless. Aveeno. It’s the only way I survive winter in Chicago.